(KATAKAMI / BOEHNER’S FACEBOOK) — Thank you. Thank you Pete Sessions, for your tireless leadership. And thank you to all our candidates, supporters, and volunteers who have worked so hard to make this moment possible. Let me just say this: it’s clear who the winners are tonight, and that’s the American people. Your voice was heard at the ballot box! Your voice! Listen, I’ll be brief, because we have real work to do – and this is not a time for celebration … not when one in 10 of our fellow citizens are out of work … not when we have buried our children under a mountain of debt … not when our Congress is held in such low esteem. This is a time to roll up our sleeves. To look forward with determination. And to take the first steps toward building a better future for our kids and grandkids. Across the country right now, we are witnessing a repudiation of Washington … a repudiation of Big Government … and a repudiation of politicians who refuse to listen to the people. Of course, this campaign is not yet over. To folks out in the West, where the polls are still open, seize this opportunity to be heard … to reject the spending sprees, the bailouts, the backroom deals, the takeovers and all the nonsense … and to join your fellow Americans in putting Washington on notice. Because for far too long, Washington has been doing what’s best for Washington – not what’s best for America. Tonight, that begins to change. With their voices and their votes, the American people are demanding a new way forward in Washington. And I’m here tonight to tell you that our new majority will be prepared to do things differently… to take a new approach that hasn’t been tried before in Washington – by either party. • It starts with cutting spending instead of increasing it. • Reducing the size of government instead of expanding it. • Reforming the way Congress works and giving government back to the people. • And for all those families asking ‘where are the jobs?,’ it means ending the uncertainty in our economy and helping small businesses get people back to work. The people’s priorities will be our priorities. The people’s agenda will be our agenda. This is our Pledge to America … this is our pledge to you! But make no mistake, the president will find in our new majority the voice of the American people as they’ve expressed it tonight: standing on principle, checking Washington’s power, and leading the drive for a smaller, less costly, and more accountable government. These are the principles our new majority will stand for, and we hope you will stand with us in the hard work that lies ahead. Because we are humbled by your trust in us. And we recognize that with this trust comes the responsibility to listen, and listen we will. Let’s start right now by recognizing this is not a time for celebration. This is a time to roll up our sleeves and go to work. We can celebrate when small businesses are creating jobs again. We can celebrate when the spending binge in Washington has stopped. And we can celebrate when we have a government that has earned back the trust of the people it serves … when we have a government that honors our Constitution and stands up for the values that have made America, America: economic freedom, individual liberty, and personal responsibility. I hold these values dear because I’ve lived them. I’ve spent my whole life chasing the American Dream. I started out mopping floors, waiting tables, and tending bar at my dad’s tavern. I put myself through school working odd jobs and night shifts. I poured my heart and soul into a small business. And when I saw how out-of-touch Washington had become with the core values of this great nation, I put my name forward and ran for office. So I want to close by thanking my friends and neighbors in Ohio for giving me the chance to serve and the opportunity to stand before you now ready to lead. 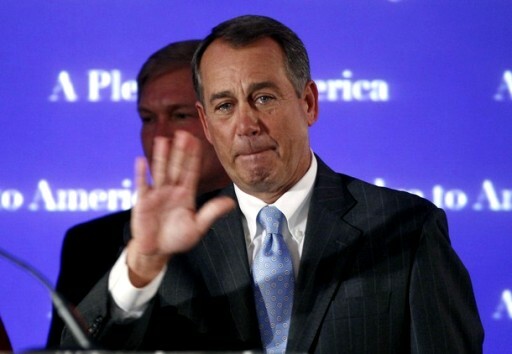 November 02, 2010 (KATAKAMI / RollCall.com) — Minority Leader John Boehner is about to get a huge promotion. The fall of the Democratic majority means the Ohio Republican is poised to become Speaker, completing a decade-long climb back to power after he was cast out of the GOP leadership in the aftermath of the 1998 elections. Boehner began building his campaign for Speaker eight months ago, outlining ways that he would redirect the House if Republicans took back the majority. Now that he has achieved that goal, his challenge will be implementing the aggressive reforms outlined in the GOP’s “Pledge to America” agenda, such as repealing the health care reform legislation, cutting federal spending, limiting taxes and simplifying the legislative process. “I think both parties will welcome returning the House to a truly deliberative legislative body,” he said. 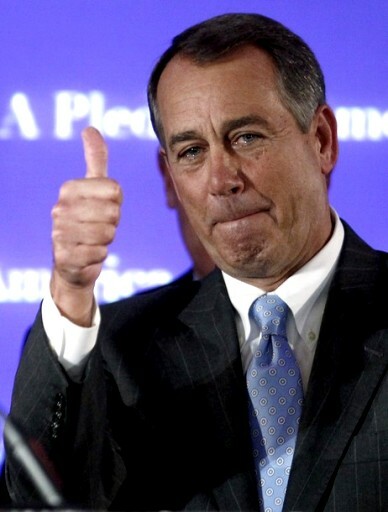 It’s all but certain Boehner will assume the Speakership; no one else has even hinted at a challenge. “He is a ‘what you see is what you get’ kind of guy,” said Rep. David Dreier (R-Calif.), who will be Boehner’s presumptive choice for Rules chairman in the 112th Congress. Boehner wasn’t always considered a Republican insider. After being elected to the House in 1990, Boehner and his fellow gang of seven members were rebels who took on the House establishment and advocated for broad disclosure of the names of Members who had abused the House Bank. By 1994, Boehner, already seen as an up-and-comer, was brought into the leadership fold by incoming Speaker Newt Gingrich (R-Ga.). After being defeated in his bid for reelection as GOP Conference chairman in the aftermath of the 1998 elections — in which Republicans lost seats despite President Bill Clinton’s pending impeachment trial ­— Boehner retreated to the Education and Workforce Committee. In that role, Boehner was known for operating a broad member services program, which is unusual for a committee chairman, but helped him build alliances and plan his return to leadership. His most widely known accomplishment at the education panel was crafting the No Child Left Behind Act along with Rep. George Miller (D-Calif.) and the late Sen. Edward Kennedy (D-Mass.). Since he began his tenure as the Republican leader in the House, a position he won in 2006, Boehner has surrounded himself with longtime political allies but has taken care to bring potential adversaries into leadership as well. Many expect Boehner to again take an active role in avoiding contentious leadership races, as he did in 2008 when he pulled Conference Chairman Mike Pence (Ind.) into leadership to defuse attacks from the right and endorsed Rep. Pete Sessions (R-Texas) to supplant Rep. Tom Cole (R-Okla.) as chairman of the National Republican Congressional Committee. “He doesn’t necessarily need to placate certain divisions because there aren’t that many competitive chairmanships,” one veteran Republican lobbyist said. November 01, 2010 (KATAKAMI / CNN) – He is poised to become the most powerful Republican in Congress if the GOP takes control of the House Tuesday. 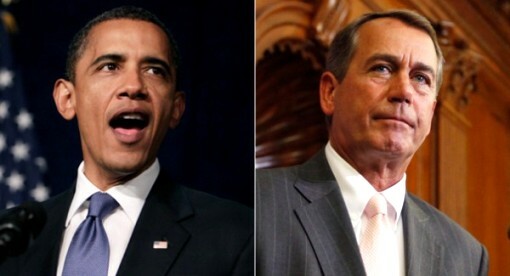 And Rep. John Boehner’s ramping up the rhetoric in anticipation, going after the president. But on Monday Obama walked the comments back. In an interview with radio host Michael Baisden he said he probably should have used the word “opponent” instead of enemy. However, that didn’t stop Boehner from continuing his criticism of the president’s word choice at a rally in Ohio for Rep. Rob Portman and Republican gubernatorial candidate John Kasich. He also took the time to encourage voter turnout, which was accompanied with another little dig at the president. 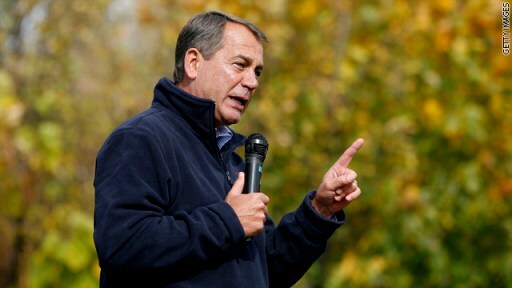 John A. Boehner, in Chillicothe, Ohio, on Sunday, could become the next House speaker. October 31, 2010 HANOVERTON, Ohio (KATAKAMI / NYTimes) — The speaker in waiting was waiting to speak, perched atop a bale of hay on a small platform outside the Spread Eagle Tavern, where the windows were draped with patriotic red, white and blue bunting. Back in his home state on the weekend before the biggest election of his career, John A. Boehner absent-mindedly flicked a hand through his hair, though it was already perfectly in place. He listened as one local conservative after another railed against Washington and the federal government and the Congress that Mr. Boehner has inhabited for 18 years, only to emerge now, perhaps improbably, as the face of much hungered-for change. With the autumn leaves fluttering down in a swirl of crimson and bronze, Mr. Boehner stood up to make his case for Bill Johnson, the local Republican candidate for the House, and more broadly for a nationwide sweep that he hopes will propel Republicans into the majority and himself into the speaker’s post, second in line to the presidency. It is a case squarely against President Obama and the current speaker, Representative Nancy Pelosi of California, whose name he always pronounces, “pell-oh-Zee” as if practicing his conversational Italian. “If you want to send Nancy Pelosi packing her bags, back to San Francisco, elect Bill Johnson,” he told the crowd. At each stop he draws on nostalgia for the Republican glory days of the 1980s, by telling the same joke. “Remember when Ronald Reagan was president,” he said. “We had Bob Hope. We had Johnny Cash. Think about where we are today. We have got President Obama. But we have no hope and we have no cash.” It draws hoots of laughter and applause every time. As he zipped across a southeastern swath of Ohio this weekend, partly by coach bus, occasionally by the black S.U.V. that is the more customary mode of transport for Congressional leaders these days, Mr. Boehner made a succinct and forceful pitch for Republican candidates and for their view of America. He is also playing it safe, refusing to answer reporters’ questions about substantive topics, including the recently foiled terrorist effort to mail explosives to the United States. Instead, he offers a sharp stump speech, tightened to about six minutes. Mr. Boehner is also reintroducing himself to voters in Ohio and by extension to an American public that still largely has no idea who he is or what he is about. He presents himself as a regular guy, an unlikely leader who sort of stumbled into elective office. His perma-tan, the result of many hours on many golf courses, has faded — either because he is working too much or in a strategic effort to — literally — tone down his appearance. Mr. Boehner is also dressing the part of regular guy, a dramatic departure from his Washington wardrobe of designer suits and ties. On Saturday, he wore blue jeans, a checkered shirt, and a blue fleece pullover with the collar turned up. On Sunday, he looked like an overgrown schoolboy in blue chinos, and a white collared shirt covered by a cable sweater with the cuffs slightly rolled at his wrists. But most striking is his argument against Washington, where he has served as the Republican leader for the last four years and was responsible for delivering Republican votes, even his own, for the big financial system bailout in 2008. 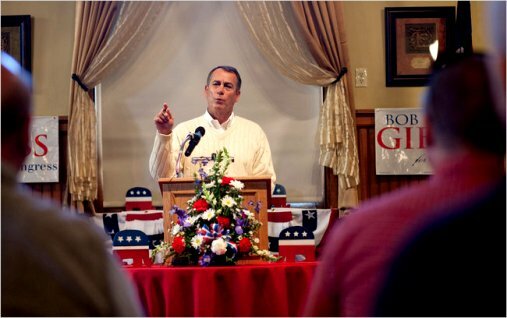 At a rally on Sunday evening in Chillicothe, Mr. Boehner nodded to his own longevity, noting that some people might say, “Well, you’re part of the problem.” But he insisted, and the hugely enthusiastic crowd seemed to agree, that he was in fact dedicated to change, including an overhaul of the way the House does business. He said he was willing to take on challenges that other Congressional leaders have ducked in the past two decades. “It’s about time that Americans come together and have an adult conversation with each other about the serious challenges that our country faces,” he said. That Mr. Boehner has the luxury of being in his home state on the final weekend of the campaign, after months spent raising tens of millions of dollars and stumping for Republican candidates across the country, is simply the lucky consequence of Ohio being a hotly contested political battleground. Both Mr. Obama and former President Bill Clinton were also here this weekend. While he is predicting a big win for Republicans, Mr. Boehner also said he would not gloat and, indeed, aides have said he would not hold a big election-night victory party. Washington (Oct 30) With Americans demanding a new way forward in Washington, House Republican Leader John Boehner (R-OH) uses the Weekly Republican Address to outline solutions for ending economic uncertainty, stopping government’s spending binge, and changing the way Congress does business. In the address, Boehner notes that this is a new approach that hasn’t been tried in Washington – by either party – and it is at the core of the Pledge to America, a governing agenda Republicans built by listening to the people. Leader Boehner recorded the weekly address earlier this week from Ohio, where he ran a small business and saw first-hand how Washington can make it harder for employers and entrepreneurs to meet a payroll and create jobs. 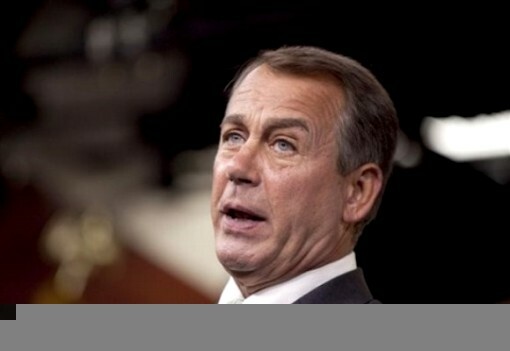 Following is a transcript of Boehner’s remarks. 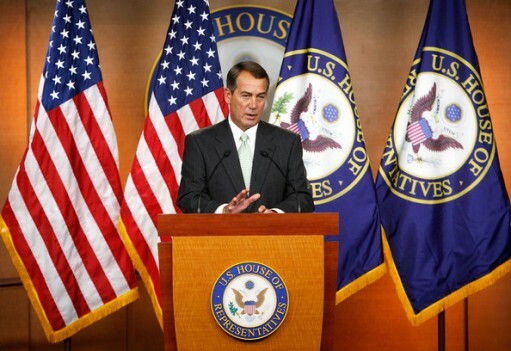 Audio of the Weekly Republican Address is available now here. The video will be available here for viewing and here for downloading. “Before I served in Congress, I ran a small business here in Ohio, and I saw first-hand how politicians in Washington can make it harder for small employers to meet a payroll and create jobs. “Well I don’t know about the world, but here at home, Americans haven’t experienced the change President Obama promised. One in ten of our fellow citizens is out of work. Our national debt has grown by $3 trillion Trust in government has fallen to an all-time low. “These problems didn’t start under President Obama. But instead of fixing them, his policies have made them worse. A ‘stimulus’ spending spree that created jobs in China and El Salvador, while millions of Americans lost their jobs here. A job-killing national energy tax. A government takeover of health care. “All these things have combined to create massive uncertainty for small businesses, the engine of job creation in America, while our children face a future clouded by debt. “Americans are demanding a new way forward in Washington – an approach that neither party has tried. “It starts with cutting spending instead of increasing it; making government smaller and more accountable; and helping small businesses get back to creating jobs again. “That’s what Republicans are offering with our Pledge to America, a governing agenda built by listening to the people. “A generation of fiscal recklessness in Washington has pushed us to the brink. Just to stay afloat, we’re now borrowing 41 cents of every dollars we spend from our kids and grandkids. “This spending spree threatens our children’s future. It’s also hurting our economy. Americans know it has to stop, and our Pledge to America puts forth a plan to do just that. We’re ready to cut spending to pre-‘stimulus,’ pre-bailout levels, saving taxpayers $100 billion almost immediately. And we’re ready to put in place strict budget caps that limit spending from here on out, to ensure that Washington is no longer on this spending binge. “We need to stop the coming tax hike. We can’t balance the budget without cutting spending and achieving real economic growth – and we won’t have real economic growth if we raise taxes on small businesses and families. “There’s a third thing we need to do to help our economy, and that’s change Congress itself. The American people are in charge of this country, and they deserve a Congress that acts like it. Americans should have three days to read all bills before Congress votes on them – something they didn’t get when the ‘stimulus’ was rushed into law. We should put an end to so-called ‘comprehensive’ bills that make it easy to hide wasteful spending projects and job-killing policies. Bills should be written by legislators in committee in plain public view – not written in the Speaker’s office, behind closed doors. “Across our nation, Americans are looking at President Obama’s policies and asking – ‘where are the jobs?’ To help our economy get back on track, we have to stop all of the coming tax hikes and cut spending – and to cut spending, we need to change Congress itself. “This is a new way forward that hasn’t been tried in Washington yet. It’s a break from the direction in which President Obama has taken our country. And frankly, it’s also a break from the direction in which Republicans were headed when Americans last entrusted us with the reins of government. The American people are in charge, and they deserve nothing less. “Together, we can do these things. And in doing so, we can begin the drive for a smaller, less costly, and more accountable government that honors our Constitution and respects the will of the people. “These ideas are at the core of our Pledge to America. “We’ve tried it President Obama’s way. We’ve tried it Washington’s way. It hasn’t worked. It’s time to put the people back in charge.